the spine with waxed linen floss. I am experimenting with the idea of journals/sketchbooks made up of pages you take with you and work on, then insert into a master book. That way you don't have to carry a big book with you, just a sheet or two of nice paper (I'm using watercolor paper) to work on. Oh this is very cool and I like all the things hanging from the spine. I hope you're going to tell how you made this!! You make the best stuff! Your color work is so fabulous, it catches my eye every time. Beautiful! Did you make the stitch paper double sided then assemble the book? 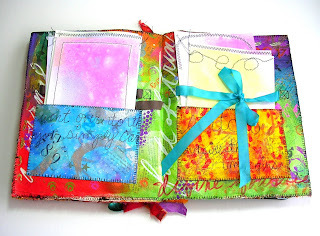 Teesha Moore has a tutorial on how to make a book from one sheet of watercolor paper. 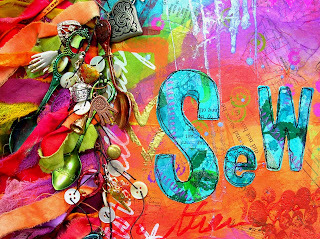 Ok OK - I am an artist-blog-lurker:) I just love your colors! This is gorgeous. You really know how to combine colors! This journal is itching to be journaled in! Please oh please tell us how to make a book using one sheet of paper! I love coming to your blog and seeing the visual feast of colors! And I'm loving your book too - one of these next fine days, I'm actually going to try some of the techniques. Really! I like this idea and of course your colors are wonderful! I had something similar in mind that I'd like to do to take camping. I thought I'd do little pages of fabric paper as well as some of mono printed fabric. I could then do my little sketches on them . I would carry a small sewing kit and do hand stitching instead of machine. I just love your zingy vibrant colours. very pretty - how big is that? of course, my covers aren't nearly as pretty as yours. 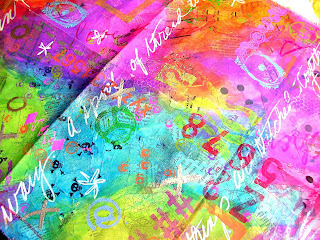 may have to finally make some of this fabric/paper to pretty it up. I did finally buy the book!!! This is so freakin awesome! I completely love it. Must go make something kinda like it immediately. tell us, tell us!! we want to make one too! !